Copyright: Photographers retain the copyright to their photographs. Photos will be credited to the photographer named in the entry form. Photographers agree to have their submitted photograph displayed on marketing materials of Vibha and Vibha supported projects; and the webpages, website, social media and blogs owned or managed by Vibha (Help Them Grow, Inc) without any fee or other form of compensation. Who can enter: Open to amateur photographers only, worldwide. 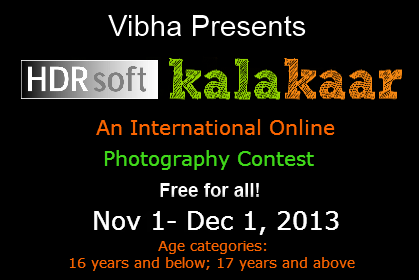 HDRsoft Kalakaar 2013, is an international online photography for amateurs. Grand Prize – One grand prize winner will receive a cash prize of $500 and a Zenfolio unlimited account (a $60 value donation). 17 years and above – Ten third place winners receive ‘Winner’ certificates issued by Certlog and their photograph will be showcased on Vibha, Kalakaar and associated social media. 16 years and below – Ten third place winners receive ‘Winner’ certificates issued by Certlog and their photograph will be showcased on Vibha, Kalakaar and associated social media. Only one photo can be submitted per person. Online submission of digital photographs via the website. Image requirements: 5 megabytes or smaller in file size; JPEG, JPG, PNG or GIF format; at least 1600 pixels on its longest side. No borders. Only minor burning, dodging and/or color correction is acceptable, as is cropping. High dynamic range images (HDR) and stitched panoramas are NOT acceptable. Judging Criteria: Creativity; Photographic quality; genuineness/authenticity of the content.